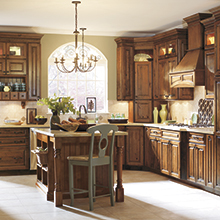 Designing a new kitchen involves more than selecting cabinets and countertops. How the kitchen fits and functions within the home and the impacts of technology and sustainability options are as integral to a successful design as selecting the perfect color palette. To jump-start your thinking regarding the options, we’ve gathered information on the latest trends. 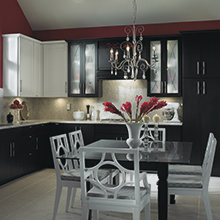 Cabinet color trends are not only focused on the popular hue of the moment. Additionally, they are a representation of how people want to feel when inside their homes. Current surroundings and how the homeowner wants to live now and into the future contribute to the overall feeling. Homeowners are increasingly deciding to continue living in their current homes rather than search for a new one, and cabinetry design trends are shifting to reflect practical kitchens and baths designed with purpose, style and overall function at the forefront. Today's cabinets not only look great from the surface, but they are accommodating homeowners' wishes for better organization, more storage and ease of use. 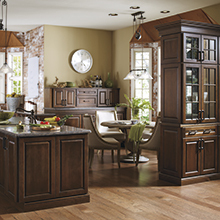 Kitchens designed with cabinetry in a horizontal orientation are steadily growing in popularity. Base cabinets that have widths of 36 inches or more mean there is less of a need to vertically stack cabinets, making it simpler to reach the items inside. Adding organizational inserts and easy access drawers to these wide base cabinets enhance the overall horizontal look while making it easy to keep clutter contained. Homeowners are grouping cabinets together to increase functionality. For example, a resourceful baker may create a baking hub in the kitchen that includes a counter work surface and storage for all baking necessities like pans and cookbooks. Or a homeowner may increase the functionality of their laundry room through the creation of an ironing area. With a utility cabinet for the iron, ironing board and spray bottles and storage for laundry or cleaning supplies, a functional ironing area is the solution for practical organization. 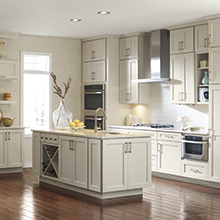 To fulfill long term design flexibility, cabinetry designs are migrating to a simpler look, using subtle details. 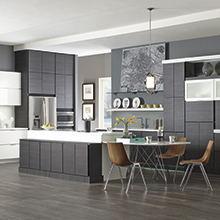 This trend is proving modern cabinetry to be a popular choice in homes today. Homeowners continue to see open floor plans as the way to go, developing a need for transitional cabinetry designs to increase the positive flow throughout each room. Using cabinetry with complementary designs and colors can create an original transition into a multi functional area, such as a large bath adjacent to a dressing room or a kitchen that opens up into an inviting family room. Art Deco design, first reaching popularity in the 1920s, is an original choice to bring the past into the present. This timeless motif is being portrayed in kitchen and bath designs with cabinetry accents like chrome fixtures and frosted glass inserts and with bold, vertical and horizontal lines of color. As technology continues to become a bigger component of our world, today's cabinetry details are shifting to accommodate the way that we live now. 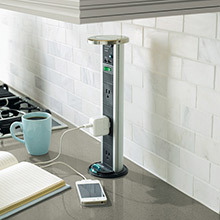 Installing cabinets with built-in charging stations for electronics and creating unique in-home workspaces for laptops and tablets are practical solutions to stay connected. Effects often associated with industrial spaces have begun to find their way into home interiors, such as slabs of concrete, blackened and burnished materials and visible copper pipes. 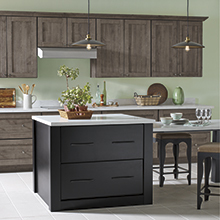 In kitchen and bath spaces, this original look can be enriched through cabinetry hardware and faucets in industrial metals or even mismatched handles. 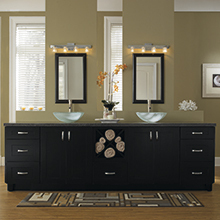 It's difficult not to be impressed by the charm of kitchen and bath cabinets with homemade design elements. 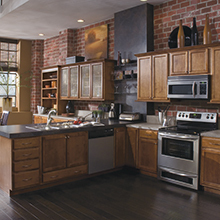 Distressed finishes and distinctive styling provide the backdrop for additional sentimental design elements, from rustic kitchen antiques to collectibles from around the globe.